What is this, banana week? Okay, I know I should probably space the banana posts out further for all you banana haters out there... although I don't really understand how anyone can hate the mildest fruit that ever lived. But these muffins just can't wait! They're too delicious not to share. And they're not as banana-y as some banana bread I've had. They're more like a light, almost caky muffin, with a hint of delicious banana flavor. I do really like my usual banana bread recipe, but I think I like this one even better! Heat oven to 350 degrees. Prepare 18 muffin cups by spraying with cooking spray or using paper liners. Mix sugar, butter, and egg thoroughly. Stir in milk. Mix in the flour, baking powder, and salt, then blend in the mashed bananas. The batter should still be a little lumpy, so be careful not to overmix. Scoop into muffin cups, filling 2/3 full. 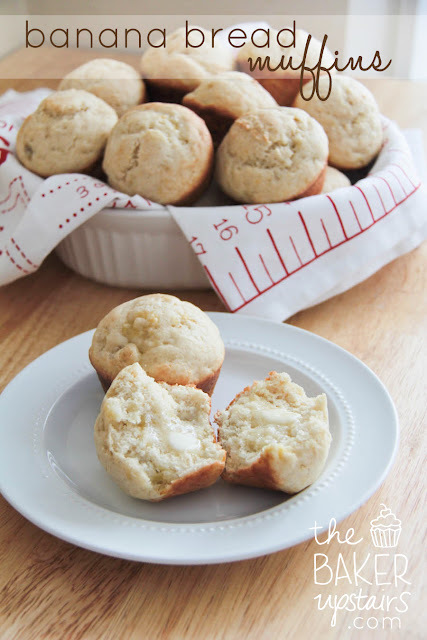 Bake for 18-25 minutes, and remove when a toothpick inserted into the center of a muffin comes out clean.